For over 20 years the fully-qualified and reliable team at Tipper Tarps have been designing, fabricating, and selling a wide range of waterproof custom tarp systems that are made to order to the specifications of our valued clients. 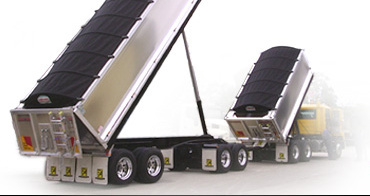 Heavy duty and offering complete protection from wet, dry, and windy conditions our truck rollover tarps are made to provide reliable cover for loads travelling over long distances. Being custom-made to suit our customer's trucks our rollover tarps create a tight seal over the top of the trailer, putting a stop to any water seeping inside. To discuss getting an electric rollover power tarp for your Truck or Trailer call us on 1300 082 777. 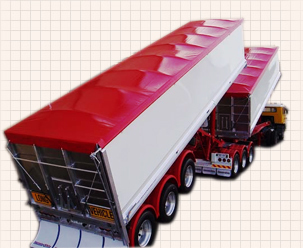 Roll over tarps are the answer for covering water sensitive loads such as grain or fertiliser. The tarp locks up tight as a drum ensuring a waterproof, long lasting cover. • High Tensile Extended aluminum Roll Pipe. • Heavy duty fully reinforced 900gsm P.V.C. Tarp. • Stainless steel adaptor shaft.